According to the theory of evolution, an organism must adapt or die. Much like evolution, types of warfare and equipment must change. These changes must be made to ensure survival of the organism, which in this analogy, is an army. The army of the early Roman Republic understood this law and changed, or adapted, their techniques to survive in an ever-changing world. Their transition from a phalanx unit into maniples was necessary for the army to survive against more loose-fighting adversaries. Like one gene that changes a whole organism, the Roman tactical adaptation set in motion many changes. One of these was the change in the soldiers’ shields. From the 10th through 7th century BC the shield of the armies of Rome closely resembled that of the Etruscans, with whom they were almost continually fighting. The shield was a large, round, convex, and made of wood. This made it very heavy. It also had a very unique grip (Sage 15). The strength of this shield was the way in which it was used. Its unique grip rendered it very awkward for single combat but made it near impossible to breach in a tight formation (Sage 14). It was made this way because the Etruscans, neighbors to Rome, fought in a phalanx. Romans evolved their earlier shields into something similar in order to defeat the Etruscans at their own game. A phalanx was a tight, rectangular formation of men. Men in the phalanx were trained to move as one. This allowed them to push back enemy troops and always protect their comrades’ sides. The large round shield of these warriors allowed a soldier on the right to cover the right side of another soldier on the left (Sage 15). Every combatant did this, and together they formed a line of protection around each other. On even ground, the soldiers were always able to cover their fellows while advancing against and battling foes. However, fighting on uneven ground proved not as effective. When on uneven ground the soldiers of the phalanx were often forced to fight on different levels from one another. This meant that they were unable to cover each other as effectively. In the 5th century BC, Rome used round shields because their fighting against the Etruscans, on even ground, allowed them to utilize the phalanx. As their adversary changed, around the 3rd Century BC, the Romans were forced to fight on more hilly and mountainous terrain (Sage 63). Their adversary, the Samnite mountain tribes, understood how to fight on uneven ground. Their fighting was more loose and single combat centered (Rosenstein 151). Seeing this, the Roman Republican Army chose to once again adapt to survive. From this decision came the advent, or evolution, of maniples. On mountainous terrain, a large phalanx was unable to maneuver. Manipular division of men solved this problem. A maniple was a smaller, more maneuverable group of soldiers. The fighters were also more spread out. Each troop occupied six feet of space, which was about double what he had occupied in the phalanx (Rosenstein 143). This new space demanded a evolution of equipment; it called for a revolutionary rectangular shield (Rosenstein 144; Sage 64). In the maniples, soldiers were asked to fight more as individuals rather then a solid unit (Sage 71). Their new shield needed to be lighter than the round shield of old and needed to provide more protection for their whole body. This means that it would be held easily in one hand (“Scutum…”). The new shield needed to be made out of slightly different materials and different dimensions then those of old. The Roman army had to adapt their equipment once again in order to defeat their enemy. The evolution in Roman battle technique and equipment was essential to the state’s survival. Shields utilized by the Roman army were adapted to be the best fit to defeat their adversary. 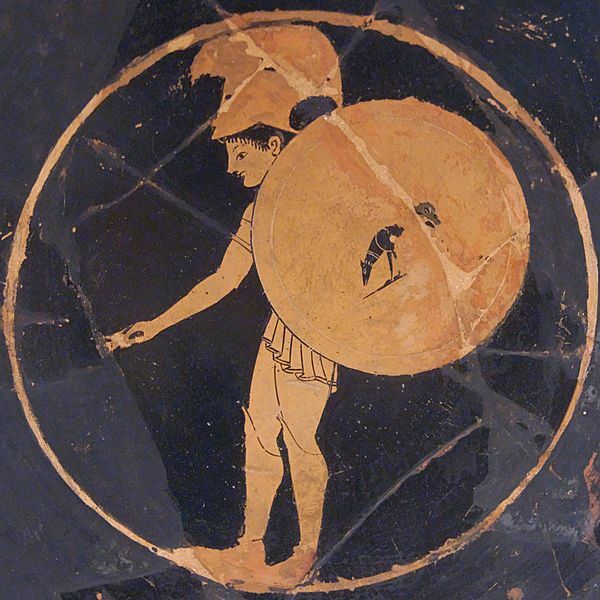 Phalanx warfare called for a larger shield to protect more than just one soldier. Movement into maniples necessitated the need for a new breed of shields. This version needed to be more mobile and agile. When utilized right, its design became the standard for the Roman Republican Army and would be utilized for many centuries to come. Cichorius, Conrad. “The Reliefs of Trajan’s Column.” Photograph. Wikimedia Commons. Wikipedia: 3 Nov. 2008. Web. 5 April 2014. Nguyen, Marie-Lan. “Hoplite wearing his shield with a dog decoration. Attic red-figure eye-cup, 500–490 BC. From Chiusi.” Photograph. Wikimedia Commons. Wikipedia: 20 Sept. 2008. Web. 5 April 2014. Rosenstein, Nathan. “Armies of the Roman Republic.” The Ancient World at War: A Global History. Ed. Philip de Souza. London: Thames and Hudson, 2008. 139-155. Print. “Scutum (shield).” Wikipedia. Wikipedia: 17 Dec. 2013. Web. 5 April 2014.